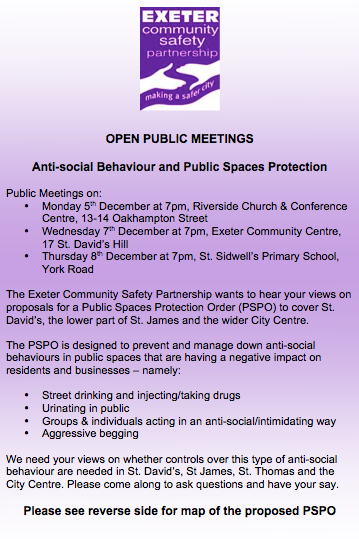 Controversial plans for a Public Space Protection Order (PSPO) covering Exeter city centre, revised after public outcry, are up for consultation. The powers would help authorities in the city clamp down on anti social behaviour. However, strong concern was voiced nationally that the proposed powers granted by the PSPO went too far, criminalising the homeless rather than helping them. Reflecting public opinion, the council has returned with proposals which have either dropped or revised certain aspects of their proposals. In particular, controls on street encampments have been completely removed from the plans. Controls on begging have been limited to solely restrict aggressive begging, where people feel intimidated. In addition, on-the-spot fixed fines for anti social behaviour have been replaced with notices issued after the offence. An option would be available for “positive action”, including Acceptable Behaviour Contracts. The revised proposals will be put to residents and businesses in a series of local public meetings in areas of the city the PSPO would directly cover. The authority revealed it had received more than 1,200 responses following a four month consultation exercise into whether a PSPO should be introduced. Cllr Rob Hannaford, Exeter City Council’s Lead Councillor for Place said: “Consultation is never a box ticking exercise – especially with something as important as a Public Space Protection Order. “We have listened to the public and will continue to do so. “However many residents and businesses in Exeter are suffering from the effects of chronic antisocial behaviour and we must be in a position to help them if there is an option to do so. In February this year, comedian Mark Thomas held a demonstration outside Exeter Civic Centre over the PSPO plans. The proposals will go before the council in February next year. 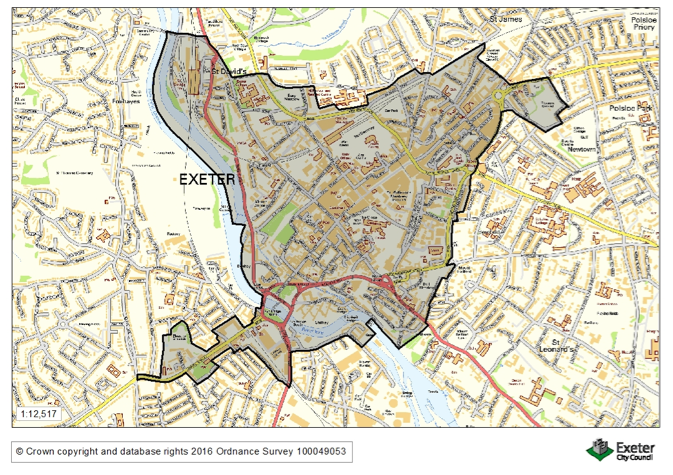 Following feedback on its consultation earlier this year, Exeter City Council has revised plans on how to tackle antisocial behaviour in parts of the City. Earlier this year the Council consulted over four months into plans for a Public Spaces Protection Order – a new power available to councils to help prevent and reduce persistent antisocial behaviour from negatively affecting local communities. – Proposed controls on street encampments have been removed from plans to go before the Council in February next year. – Controls on begging have been limited to tackle problematical aggressive begging only, where people feel intimidated. – In addition on-the-spot fixed penalties notices for anti-social behaviour will not be the preferred option, instead notices would be issued retrospectively and contain an option for positive action such as Acceptable Behaviour Contracts, which have nationally seen success at changing behaviour for the better. The revised proposals will now be put to residents and businesses in a series of local public meetings in areas the PSPO would directly cover. The controls include looking to tackle antisocial behaviour in public spaces where people are openly injecting/taking drugs, problematical street drinking, urinating in the street, and carrying out aggressive begging or other anti-social behaviour. E&E | Is Exeter’s allocation of pothole funding fair? Is Exeter’s allocation of pothole funding fair? Concerns have been raised over the amount of pothole funding Exeter has received compared to other areas of the county. In April, the Department of Transport announced a Pothole Action Fund to improve local roads and deliver better journeys. Devon is receiving an extra £1,952,000 in 2016/17 from the fund, which includes roads and pavements. However, the new figures which have revealed have been criticised by Rob Hannaford , Labour county councillor for Exwick and St Thoma , and a member of Exeter Highways Committee. He said: “With the very poor state of many roads and pavements in Exeter, any new investment to help clear the massive backlog is welcome. “However it’s a very real concern that the Exeter funding allocations are amongst the lowest across the county. I view this in the context of Exeter having the busiest most used roads, as opposed to all the other much less used rural residential roads in the country areas, as this is primarily about the non arterial routes. “For example, all of Exeter’s nine county members gets £108,7222 , yet sparsely populated Holdsworthy, one county member, gets £99,979 , or Bideford South and Hartland, again one county member, gets £92,932. “If you also look at another districts such as those county ward areas that make up the East Devon area, again their individual allocations per county ward are higher. A part of St Thomas is due to have an early spring clean. In response to local concerns from residents, local councillors have been able to confirm areas that are to get a deep by the City Council this year. The areas currently on the list are Old Vicarage Road, Tin Lane , Powderham Road, Shaftesbury Road , Duckworth Road , Barton Road through to the Cowick Street entrance, Church Path Road, Holland Road, Parkhouse Road, Coleridge Road, Churchill Road , and the rear of Cowick Lane that backs on to the terraced areas. The clean up time will run from Monday the 14th March to Thursday 24th March 2016 and focus primarily on those roads that have been so far identified. Local councillor Paul Bull said: “This was one of the main issues that we picked up locally after listening to local people in this part of St Thomas, so we wanted to get these areas on the list for action , especially as many of the back alleys are getting very grubby , weeds need pulling , and there is some general dumping and litter, and we are regularly getting complaints. Cllr Hannaford added: “it will be really good to get some spring cleaning done at these locations. “It’s been a rough old wet winter and the mild weather has meant that many of the weeds have not died back as usual so, with all the high winds and storms, they will have been a magnet for litter blowing around. If residents would like more information , or suggest other areas in St Thomas that need attention, please email cllr.paul.bull@exeter.gov.uk , rob.hannaford@devon.gov.uk and cllr.hannah.packham@exeter.gov.uk. During the current financial year , St Thomas Cllrs Hannah Packham and Rob Hannaford have agreed the following community grants for local groups and residents. St Thomas Methodist Church: £300 for raised beds. St Thomas Bowling Club: £200 for a new hot water urn . Pinces Garden: £300 for a Garden Party this coming May. Pinces Gardens Bowling Club: £300 for new crockery and folding tables. Age UK: £225 towards a Dementia allotment project. The Bloom’In St Thomas Group: £300 for new wildflower plantings. Cllr Packham said: “ It’s been great to use these local grants in St Thomas for a range of very worthwhile projects. “It often means that when an issue arises , or a piece of equipment goes wrong , we can be proactive straight away. “For many small organisations relying on volunteers, grants up to three hundred pounds can make a big difference. Fellow St Thomas Cllr Rob Hannaford , who originally set up these grants when he was the Portfolio Holder for Housing and Communities, added: “These delegated ward grants that all City Councillors have each year do a huge amount of good positive work across the whole city , that often add value to the grass roots fund raising efforts by volunteers. “Over many years we have always made full use of them in and around St Thomas. Cllr Hannaford added: “Another important element to the grants is providing local ward members with an important tool in fulfilling their leadership role of local community champions. The recent budget setting meeting at the City Council confirmed that each of the new three member wards will have £3,000 each. If people would like information , guidance , or to make an application. they are encouraged to make contact with their local councillors , or Dawn Rivers, the Community Involvement and Inclusion Officer at the City Council, who can be emailed at dawn.rivers@exeter.gov.uk . Exeter City Council’s Housing Revenue Account stands to lose nearly £8m as a result of the cut in Council rents imposed in George Osborne’s recent budget. Having agreed a rent formula with Councils two years ago that was designed to allow them to plan their housing finances with some certainty for the next ten years, the government has now scrapped this agreement and instead imposed four years of rent cuts. This will wipe £7.9m from the budget the City Council uses to provide services to its tenants and invest in their homes. Cllr Rob Hannaford, Lead Councillor for the Housing Revenue Account said: “This is a decision that seems to have been taken by George Osborne with no thought or understanding of the consequences. This will force many Councils and Housing Associations to slash the amounts they were intending to spend on investing in their assets and building new homes to ease the housing crisis. Exeter City Council is the landlord for nearly 5,000 homes and is the biggest landlord in the city. The Council is exploring the possibility of a legal challenge to the government in partnership with other local authorities. EXETER’S switch over to part-night lighting has been described as a “fiasco” by councillors who are calling for the scheme to be halted. Devon County Council’s scheme to switch off street lights between midnight and 5.30am has been rolled out across the whole of West Exe, with the rest of the city set to follow. But some street lights have since been on all day, and some lights which should be on at night for safety reasons have remained off. The lights are controlled by a £1.7m computer and the county council has admitted there have been ‘issues’ but says that these are being resolved. Rob Hannaford, county councillor for St Thomas and Exwick said: “Over several months I have received complaints from angry residents about street lights being left on all the time. 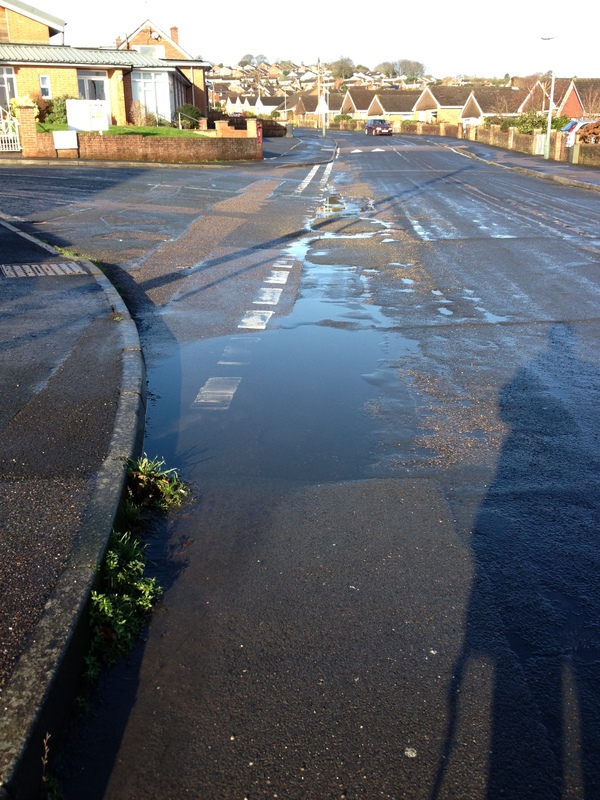 “Some of the worst areas are around Redhills, Buddle Lane, Farm Hill, Queens Road, Gloucester Road and Cowick Street. Most people were not on balance in favour of the switch-off, however now they are furious about the waste of money these faults are causing. Cowick city councillor Paul Bull is calling for the programme to switch the rest of the city over to be halted until the problems are resolved. Cllr Bull believes the problem has been caused because the county council has been ‘skimping’ and not enough control modules have been put in to allow signals to be picked up from the central computer. Roy Hill, county councillor for Alphington and Cowick agreed, said: “All these problems should mean that the county council puts a complete halt to the switch off until they have worked with the manufacturers to iron them out. Also if the city’s topography is challenging for the new system why was this not investigated and trialled before the new kit was installed? A spokesman for the county council said: “Each area controller uses radio waves to control a maximum of about 250 lights over a 1km radius, but communications can be affected by the local building landscape. “Initial mapping provided by the suppliers has, in general, worked well for the six wards that have had the remote monitoring equipment installed. “As this is new technology there are occasions where issues arise but adjustments are being made to achieve complete coverage. In this instance an additional branch is being installed in Okehampton Street; a number of lights will be assigned to it and the issue of day-burners should be resolved. The switch over in Duryard and Pennsylvania is more or less complete, St James’ has started and St David’s will start during October.